The SSL 1021 Steiner Filter is a 1 MU revision & enhancement of our popular but discontinued 1020 Steiner module, which was 2 MU. All the same crazy goodness is still there, plus a hidden feature that calms it down a bit without losing that wet, slippery sound everyone loves. The Steiner filter is a unique filter for sound shaping that synthesists have long admired for both its warmth and quirkiness. Invented by Nyle Steiner in the early 1970’s, this filter was used in Nyle’s Synthacon synthesizer line and has been lovingly recreated and updated as part of our modular line. The SSL 1021 Steiner Filter is a 1 MU revision & enhancement of our popular but discontinued 1020 Steiner module, which was 2 MU. All the same crazy goodness is still there, plus a hidden feature that calms it down a bit without losing that wet, slippery sound everyone loves. Just have a look are the reviews! At first glance, it may appear to be another 2-pole State Variable type filter with it’s high-pass (HP), band-pass (BP) & low-pass (LP) outputs. But that’s where things get turned upside down. The 1021 has HP, BP & LP inputs, not outputs. These allow for all sorts of CUTOFF (center frequency) controlled “mixing” of input signals. Due to the unique way it’s inventor injected the inputs into the internal signal path, they tend to slightly interact with each other and the control voltages, making the 1021 a bit more organic and unpredictable than many other synth filters. The RESONANCE also interacts with the CUTOFF adding an additional natural touch and warmth. But if you really crank the RESONANCE up, you can make all that warmth go out the window because at or near oscillation, the 1021 starts to squeal and complain like a school girl tantrum. There’s a hidden feature built into the Cutoff frequency knob. When pressed in, the 1021 switches to a “warm mode” that allows more subtle control over its settings. Pull the knob and you go right back to the original crazy Steiner – but watch your speakers and ears. Dogs run for the hills in this mode! Continuous control of filter center frequency from sub-audio to way up there! Ranges from 10V PP or higher, but can be overdriven at high input and resonance levels. +15V @ 25ma, -15V @ 13ma, Synthesizers.com 6 pin Molex standard. Height - 8.75" Width - One Moog Units (MU) - 2.125"
2) my “go to” filter sound is “creamy” (think Prophet V/SSM2040 or Ladder filter). 3) None of the demos that I heard of the Steiner were very compelling. I had a chance to try the Arturia MatrixBrute (which includes Yusynth Steiner filter). I was pleasantly surprised by that implementation. Also, I’ll admit it, I’m a sucker for a sale. 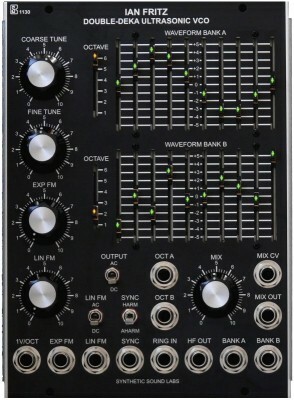 When I saw that the SSL Steiner Filter – Model 1021 had been marked down from $299 to $225 I ignored the impending spousal wrath and ordered it. (jk about the wrath). One of the things unique about this filter is the mixing of inputs into different responses. You can achieve virtually any response with it. Another thing is the (almost hidden) switch in the Cutoff frequency knob. Push it in, and you get a relatively tame response range on the resonance. Pull it out and the resonance jacks up to “11”. (you can still calm it down at lower resonance levels). Additionally, there is an interaction between the resonance and frequency that is hard to define. Even the input material seems to have an interaction with these. Drive it with a repeating gate (lfo or sequencer) and the response changes from note to note, even if the incoming pitch does not change. That makes for a much more interesting and musical result. The inputs will also overload with either high resonance or input from a couple of different inputs and a resonance new oscillation. That’s a nice aggressive feature. A good starting point is two different oscillators going into the LP and BP inputs, with those two input levels set to the center detent (middle). The resonance can also be set at the center detent. The Steiner filter is a different animal. It can be tame and a bit creamy or it can be wild and screamy. The great thing is that there’s control about where along this spectrum the filter goes. Similarly, the filter frequency response can be a more traditional 2 pole 12 db/octave low pass, or you can literally mix it into virtually any response. This one will provide hours of fun, with a palette that compliments your ladder filter.